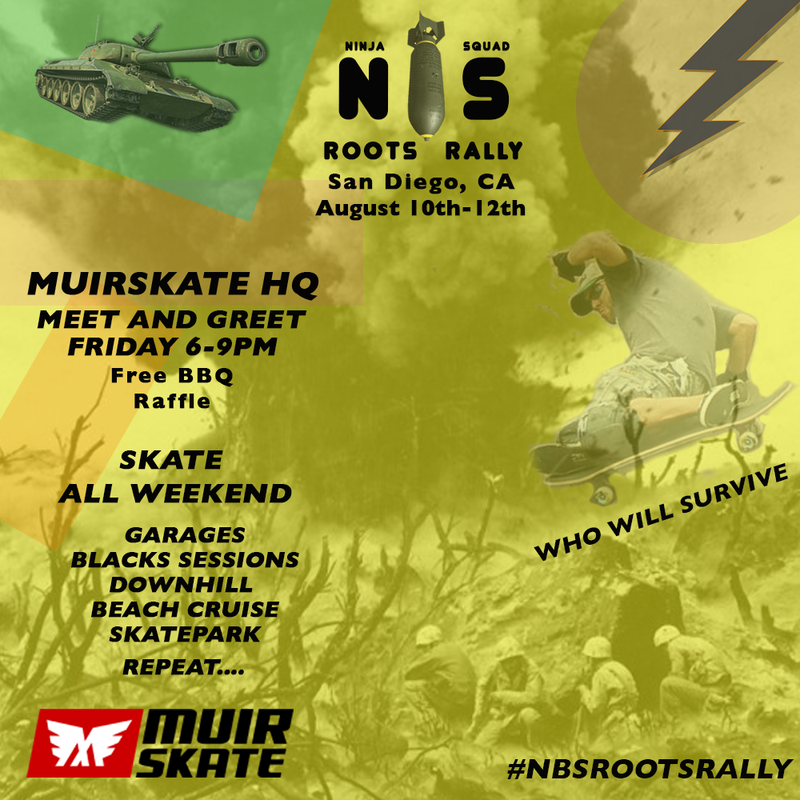 Come hang out with NBS & Muir Skate for a reunion weekend. If you want to slide with us, come shred. If you want to grind with us, come bark some coping. If you want to push, come kick the boardwalk with us. If you just want to learn, come watch and get some tips from the crew. And if you just wanna chill and reminisce, come hang on the hills with us. We'll be eating, drinking, and skating more than anyone should! No points, No places, just FUN. Fourteen years ago, Muirskate dug its ROOTS in right beside the Ninja Bomb Squad! NBS built the foundation for downhill sliding here in San Diego! We owe a lot to these guys. Muirskate is taking a step back in time by hosting a 3 Day NBS ROOTS RALLY here in San Diego, August 10-12. On Friday August 10th at 6pm PST, we will post all 3 days skate session times and locations! The details will be available at Muirskate.com, Instagram, Facebook, and in the Muirskate Newsletter! Attend every session or pick your favorite! There is something for every skater new to advanced! Use Hashtag #NBSROOTSRALLY on your posts.